This is a sponsored post as per our disclosure policy. 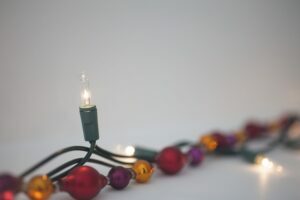 Last year, we wrote a wee postie about some great money savings ideas for Xmas, but we didn’t cover something that is actually rather important to be aware of at Christmas…what money you can claw back if you save on energy. You would be surprised at just how much blooming energy we all use when we are trying to get everything sorted for the big day. I don’t mean the energy required to get around the shops and beat the queues at the cashdesks; I mean the energy that helps power your everyday household. How much money can we save and put into the pot for next year if we are all just a little bit more careful about what we are using in those Christmas preparations? To start, we can check the amount of energy we are using by visiting a tool like E.ON’s Saving Energy Toolkit. Available to E.ON customers, this handy tool lets them track their energy use and even plot it against similar households in their local area to see if they’re on par with everyone else. Believe it or not, our energy companies are trying to help us keep our energy costs down. If we are payin more than we would like, we might switch. Clearly, this is not something that they want us to do. We all like everything to be “just so” at Christmas, and that means giving the house a good clean, and ourselves one too. However, bear in mind how much water you are using, and use it sensibly. Even down to the smallest things like making sure you only fill up the kettle for the amount of water that you need for that Christmas morning brew. In our house, making sure we are all “just so” includes cleaning the sheets, duvets, tables cloths, and all the other Christmas linen. This means extra washing. Nevermind that the kids are off school, and so are bound to get covered in all manner of dirty stuff as they try and cause trouble in the garden. The washing machine becomes our constant friend over the Christmas period – so why not turn it down a notch? You will save on energy just by doing this. The energy saving trust has some great tips on keeping the energy use for your laundry to a minimum. Think about it over Christmas, and you might even have a little extra for another pig in blanket with your Turkey! Turning the washing machine down isn’t the only way that we can help, just with the turn of a dial of the flick of a switch. Did you know that over 49% of us overcharge our devices, particularly mobiles and laptops? When that new phone you get for Christmas reaches the 100% bar – turn if off. You will be surprised on what you can save on energy if you do. At Christmas, the kitchen is pretty central to the smooth running of the day; so make sure you are using it with all those energy saving ideas in mind. Anything from not heating up the oven too soon, to using the hobs smartly. Only put on the right sized pan for those hob rings, so you don’t waste energy heating a pan that’s too small for the hob you are using. Little things these may be, but your turkey, well depending on the size of the family that could be a VERY big thing! Consider only cooking the Turkey crown, just as we suggested in our post earlier this year on cooking turkey from Marco Pierre White. This takes less time to cook, and so less energy. Use the rest of the oven while you are cooking the bird as well, so make sure you are roasting your tatties in there too. Finally, have you taken a look at the little dial and box on the wall thingy that controls all of your energy? Do you need it up as high as it is? Is it really THAT cold, or would turning it down a degree make a difference to the energy you used, and not that much difference to how warm the house is? Do you have any other Christmas energy saving tips you would like to share with us? Source: Statistics for this article are from https://www.eonenergy.com/for-your-home/saving-energy.